According to a new market report published by Transparency Market Research “Pharmacovigilance Market - Global Industry Analysis, Size, Share, Growth, Trends and Forecast, 2014 - 2020”, the global pharmacovigilance market was valued at USD 2,426.6 million in 2013 and is expected to expand at a CAGR of 14.2% from 2014 to 2020 to reach USD 6,104.1 million in 2020. Growing pressure on the pharmaceutical industry to detect early signals of drug disasters and interactions, rising concerns regarding public safety issues and stringent regulatory inspections have fueled the growth of the global pharmacovigilance market. A number of high profile drug withdrawals in the past few years have prompted various biopharmaceutical companies to follow the guidelines of Good Pharmacovigilance Practice (GPvP) in order to maintain their reputation and position in the global market. Various factors such as early detection of suspected as well as unsuspected adverse drug reactions (ADRs), prevention of unnecessary hospitalization of patients and increasing number of clinical trials are expected to drive the growth of the global pharmacovigilance market from 2014 to 2020. The phase IV clinical trial or post marketing surveillance segment accounted for the largest share (over 60%) of the pharmacovigilance market in 2013, as this stage involves active and systematic collection, analysis and interpretation of data pertaining to the marketed drug. Continuous assessment of benefits and hazards associated with drugs in order to reduce health risks is also expected to drive the growth of the segment. However, the phase III clinical trial segment is anticipated to grow at the highest CAGR from 2014 to 2020. Requirement of risk assessment studies during the crucial stages of clinical drug development, assessment of medication errors and development of comparative safety data are the major factors attributed to the high growth of the phase III clinical trial segment. Among the various methods conducted for pharmacovigilance, spontaneous reporting method held the largest share in 2013 and is expected to witness steady growth during the forecast period. Factors contributing to the growth of this segment are facilitation of detection of previously unknown effects of a drug by providing information from real life clinical events and relatively inexpensive nature of the reporting method. Moreover, spontaneous reporting method generates safety signals effectively by detecting new and rare ADRs. Based on the nature of services, pharmacovigilance activities are performed either in-house or are outsourced to contract outsourcing service providers. The contract outsourcing segment dominated the market, accounting for a share of over 50% of the pharmacovigilance market in 2013. The segment is also estimated to grow at a higher CAGR, as contract outsourcing is deemed a cost-efficient solution that uses the expertise available with the contract research organizations (CROs). Moreover, pharmaceutical companies opt for outsourcing pharmacovigilance services to various CROs in order to reduce the workload and provide more development opportunities to their employees. This is likely to propel the growth of the contract outsourcing service segment during the forecast period from 2014 to 2020. In terms of regional market analysis, North America accounted for the largest share (over 35%) of the global pharmacovigilance market in 2013 due to increasing clinical research activities and presence of large-scale research units in the region. Additionally, rise in mortality due to adverse drug reactions is propelling the growth of the pharmacovigilance market in North America, especially in the U.S. According to the U.S. FDA, over two million serious ADRs and approximately 350,000 adverse drug reactions occur in nursing homes in the U.S. each year; these could be prevented if proper drug safety measures are followed. On the other hand, Asia Pacific, including countries such as Japan, South Korea, Malaysia, Thailand, India and China, is witnessing rapid growth and is anticipated to expand at a CAGR of over 13% during the forecast period due to large skilled workforce and constant challenge to harmonize pharmacovigilance system in developing economies. Furthermore, increasing government initiatives to spread awareness about the safety and efficacy of drugs would trigger the growth of the pharmacovigilance market in Asia Pacific. 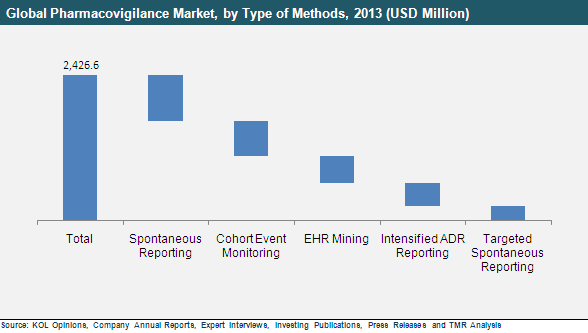 The global pharmacovigilance market is highly fragmented. The impressive growth of the pharmacovigilance market is likely to attract various BPOs and CROs to the market. Major players operating in the pharmacovigilance market are Covance, Inc., PAREXEL International Corporation, Quintiles Transnational Holdings, Inc., F. Hoffmann-La Roche Ltd., Cognizant Technology Solutions, Accenture plc, Pharmaceutical Product Development, LLC, (PPD), GlaxoSmithKline plc, Novartis International AG, and Wipro Limited.